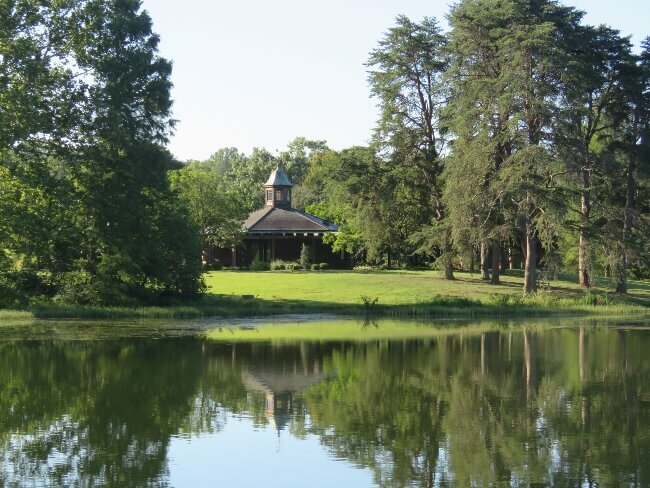 Just 27 miles from downtown Louisville lies Bernheim Arboretum and Forest. 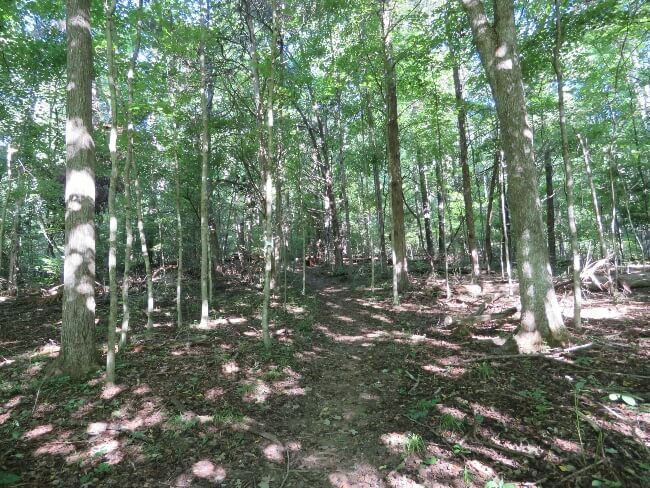 Almost 16,000 acres of nature await to be explored less than 1 mile off of I65. Admission is free on weekdays and costs just $5 per car load on weekends and holidays. 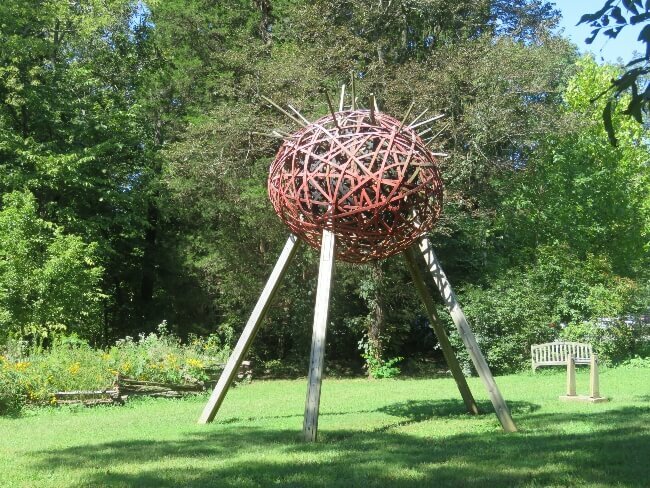 If you visiting Louisville, then Bernheim Forest makes a wonderful day trip. Located adjacent to the Jim Beam Distillery in Clermont, Kentucky, it is also an easy stop for those visiting the Kentucky Bourbon Trail. Read on to find out what to expect. 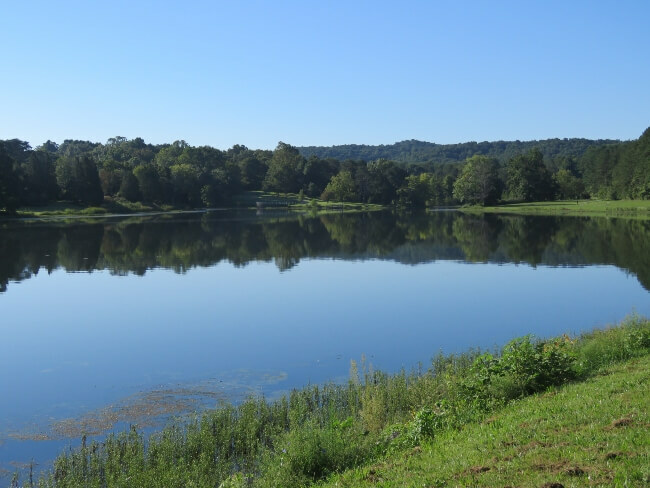 Bernheim Forest is comprised of two sections, the 600 acre manicured and maintained arboretum section and the 15,000 acre native forest. Hundreds of species of native and non-native of trees and shrubs line paths and dot the landscape. Labels help make identification easy. 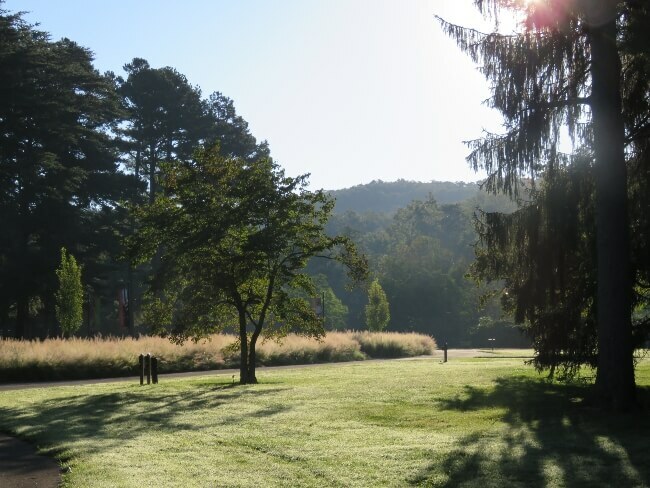 The Visitor’s Center is a great place to begin your adventure. Enjoy the architecture and design of Kentucky’s first LEED platinum certified building. Inside, you can pick up a map to show you where to find trails and highlights. 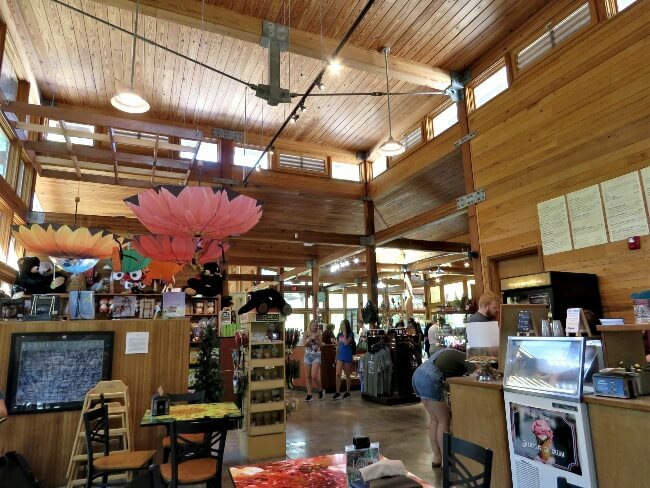 The gift shop sells souvenirs, gardening supplies, Kentucky made food products, and more. From 11 – 4 each day, Isaac’s Cafe serves tasty salads and sandwiches. The greens for the salads are grown on site in the edible garden. Many of the other ingredients are locally sourced Kentucky Proud products, too. I chose “The Rattler” sandwich. While not fancy, generous portions of ham and cheese with honey mustard sauce grilled to a warm, gooey perfection hit the spot. 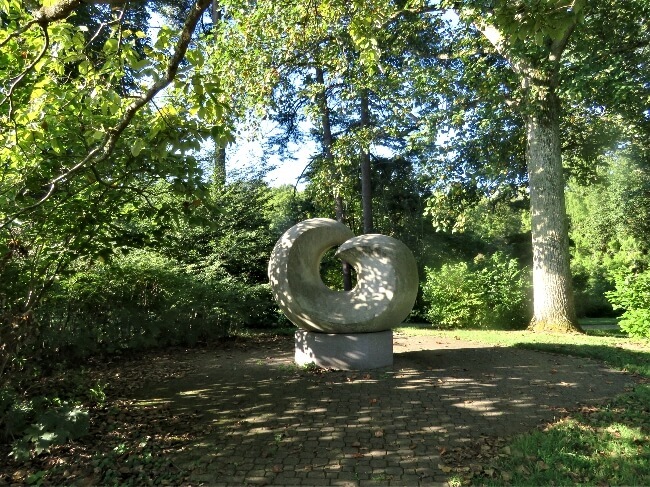 Within easy walking distance of the Visitor’s Center, you can explore several gardens. 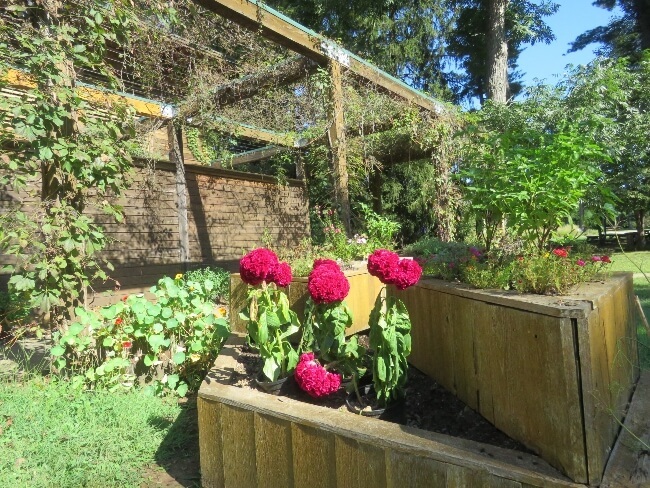 Varieties of fresh salad greens that are served in Isaac’s Cafe grow in the edible garden. 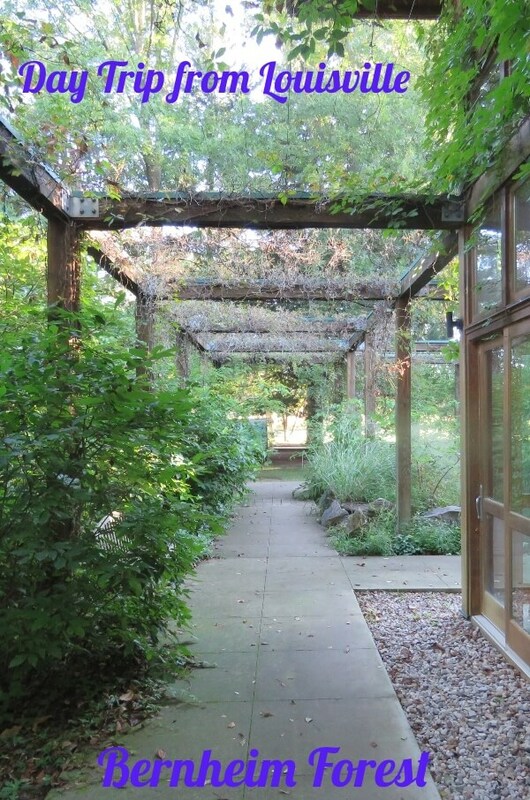 In the Sensory garden, pinch off pieces of fragrant herbs and enjoy the aroma. 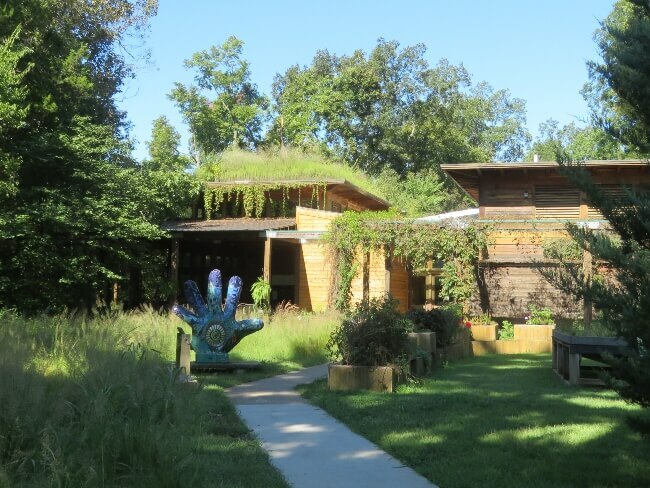 Native flower gardens, wetland gardens, and other flowers await. 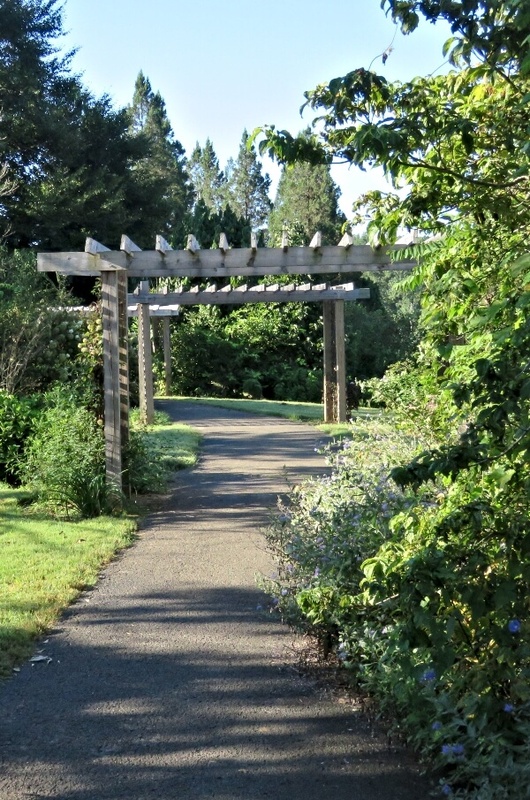 In the 600 acre arboretum section, easily accessible trails lead through each unique part. 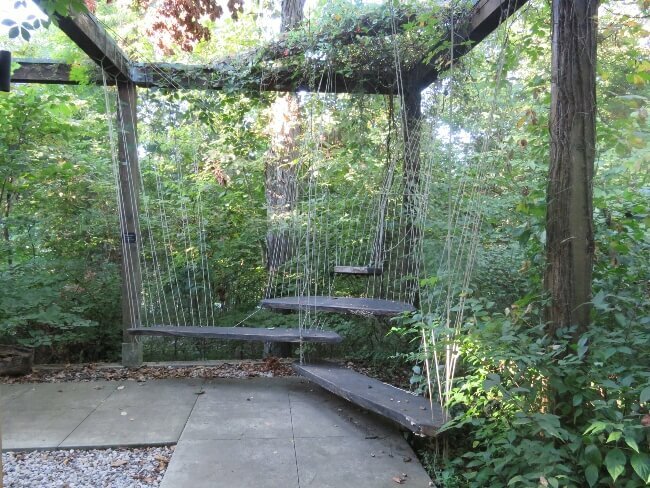 Walk along paved, crushed stone, or boardwalk paths for relatively easy access. 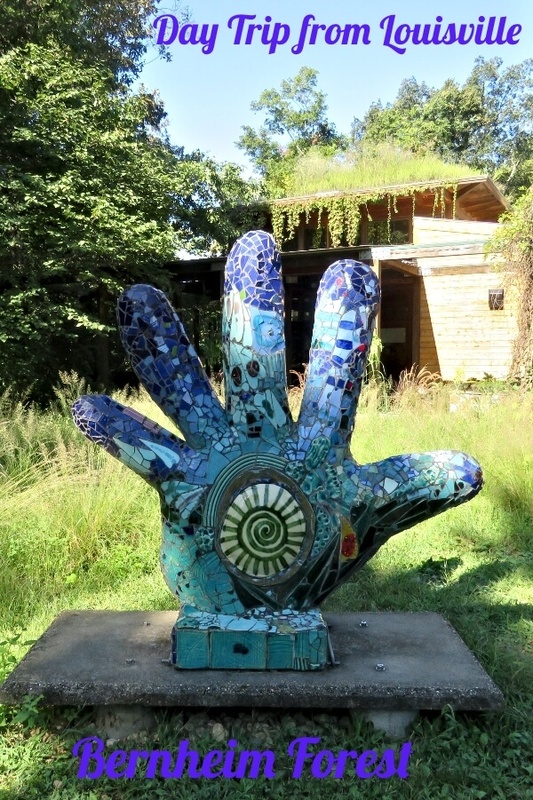 Each trail highlights a focal point: art, water, gardens, trees. 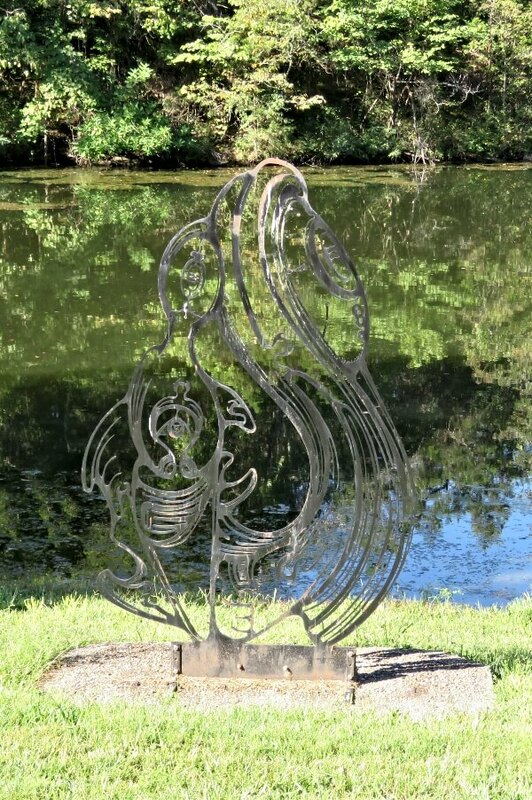 Works of art add to the natural beauty. I love the added focal points and how they integrate into the environment. 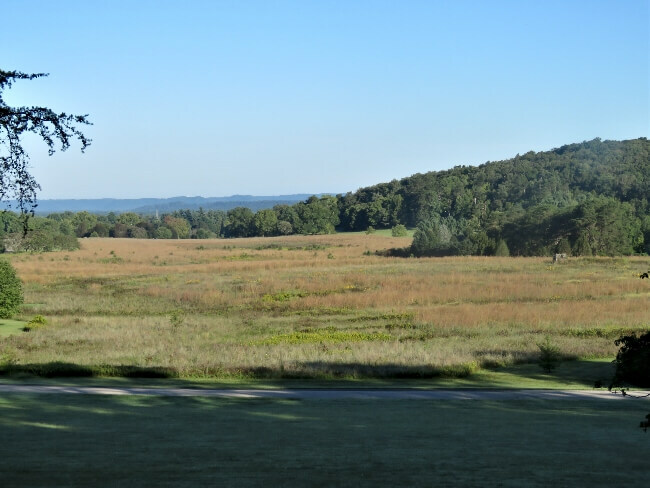 Wonderful vistas overlook a native, tall grass, prairie. Trails lead around and through it. An educational center, separate from the Visitor’s Center, provides more opportunity to learn about the area. A snake lives in a fish tank. I personally do not like snakes! I do enjoy the bird viewing area, though. 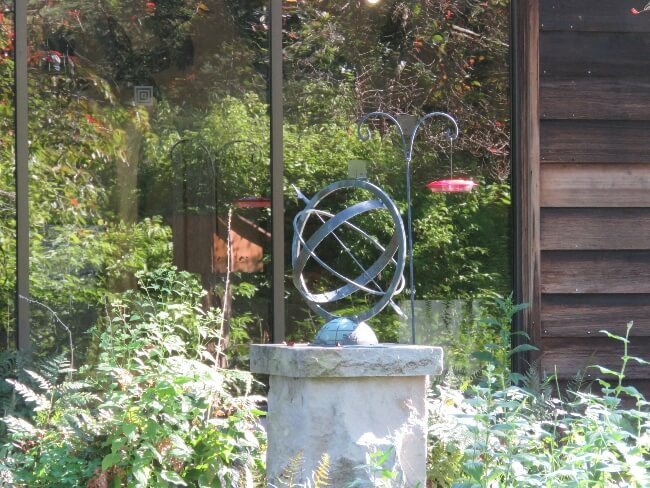 Sit quietly in air conditioned comfort and watch birds feed just a few feet away: cardinals, woodpeckers, titmice, and more. 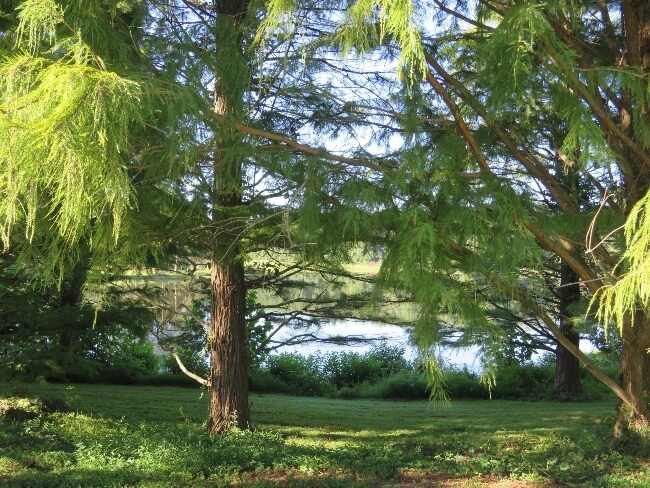 Bald Cyprus trees encircle lakes and ponds. The rays of the rising sun play off of the lacy dangling leaves. Bullfrogs croak and jump into the water as you pass. Bass and bluegill swim beneath overlooks hoping for a handout. 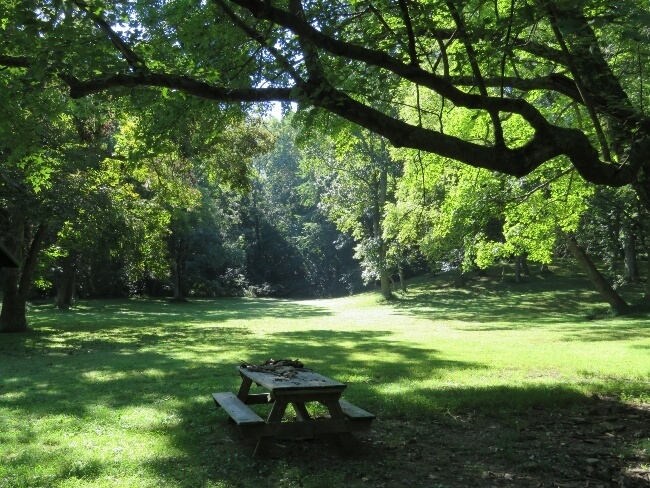 Meadows in the woods provide a picturesque setting. 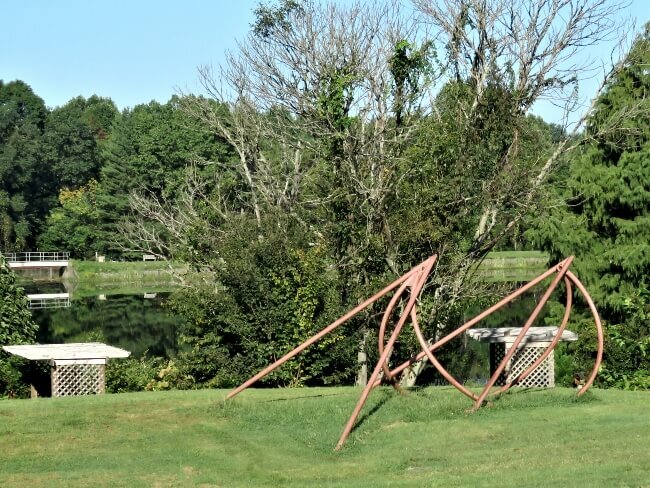 Amphitheaters, benches, and picnic tables let visitors rest and take in the setting. 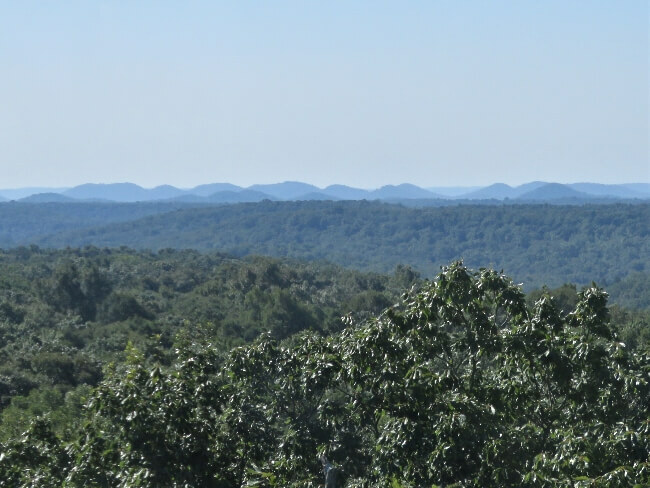 90 years ago, strip mines covered the entire 15,000 acres. Wind, water, birds, and squirrels spread all the seeds for the forest; no planning involved. Now, the forest seemingly stretches as far as the eye can see in all directions. The forest road winds up and over hills. It takes you to multiple trails, vistas, and the two main site seeing areas. 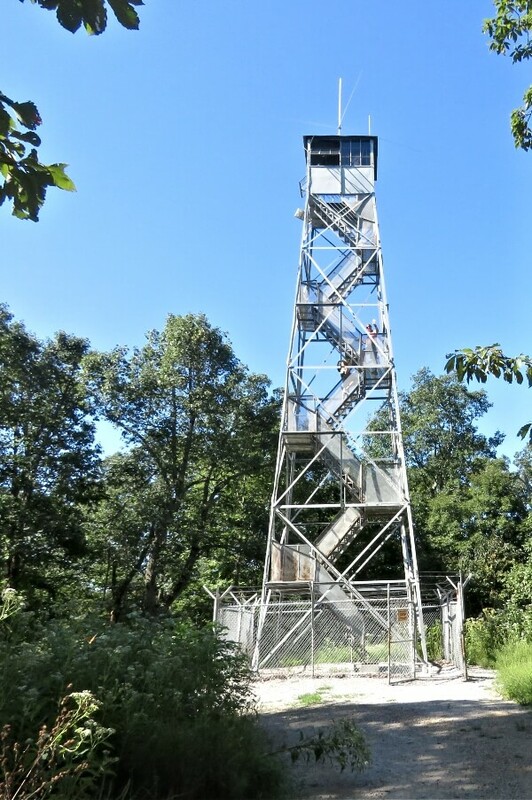 About a 1/4 mile from the forest road, a fire tower, perched at one of the highest points, stretches 96 feet above the forest floor. A park volunteer allows 4 people at time to climb the tower and take in the views. He is pleasant and informative. He pointed out important area sites that can be seen. 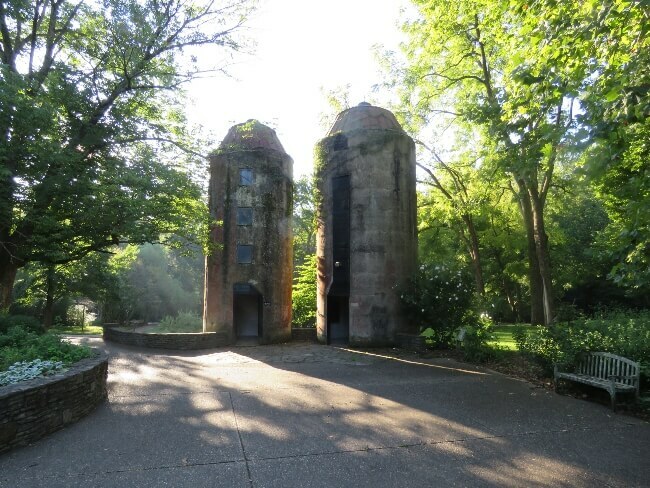 Bardstown, where you will find “My Old Kentucky Home” lies 8 miles southeast. Abraham Lincoln’s birthplace, Hodgenville, Kentucky, is located by the knobs about 30 miles south. To the north, a communication tower stands, marking Louisville. I joined a couple from Connecticut in the watchtower. They told me that they had already visited Museum Row and the Kentucky Derby Museum. The couple had spent a day on the Kentucky Bourbon Trail. On another day, they had visited Keeneland Horse Track in Lexington. They could not believe that the Louisville area was not a more popular tourist destination. 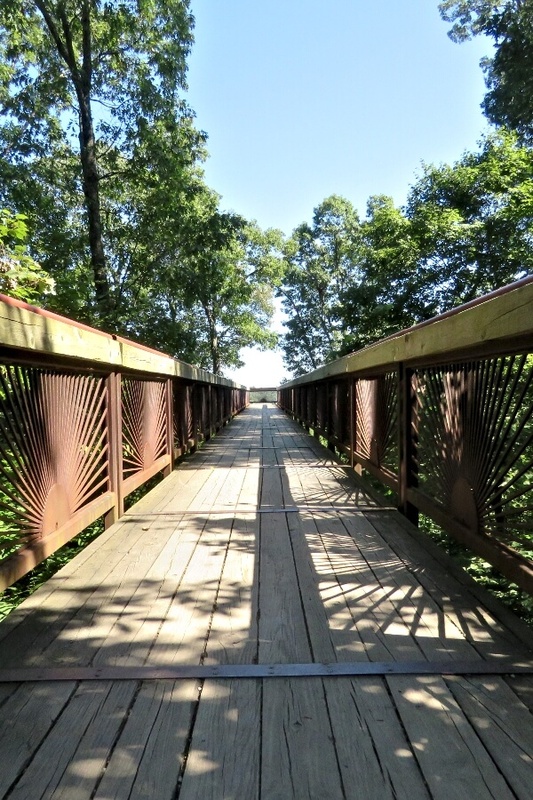 Right off of Forest Road, the Canopy walk stretches over the forest, 75 feet above the floor. Honestly, it wasn’t that impressive, but only took a couple of minutes. Whereas the trails in the arboretum section are easily accessible, single and double track dirt trails take you through the forest. Some are short, but almost all are hilly. I love the way the dappled sunlight breaks through the trees. 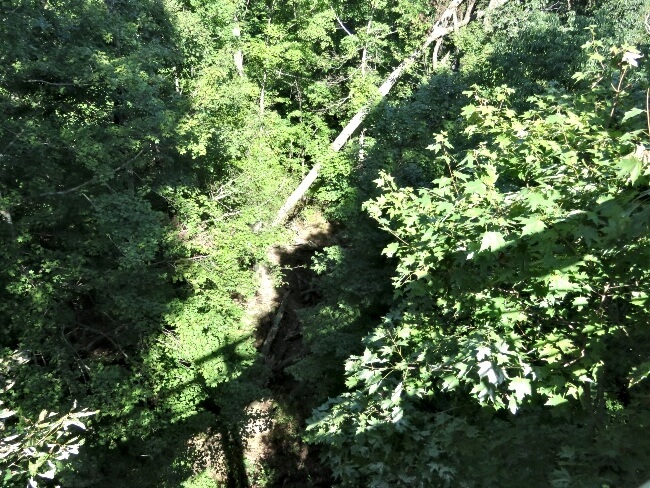 Only experienced hikers should attempt several of the trails. The longest winds for 13 miles. Check to make sure which trails are open. The last time that I visited, they had closed the longest two trails due to a heat index of over 100. Tramping through the woods takes me back to my childhood. 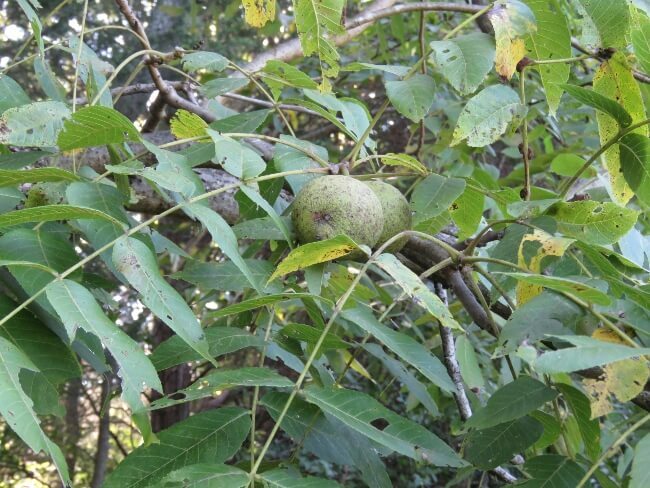 I spent hours wandering through and playing in the woods behind our farm. 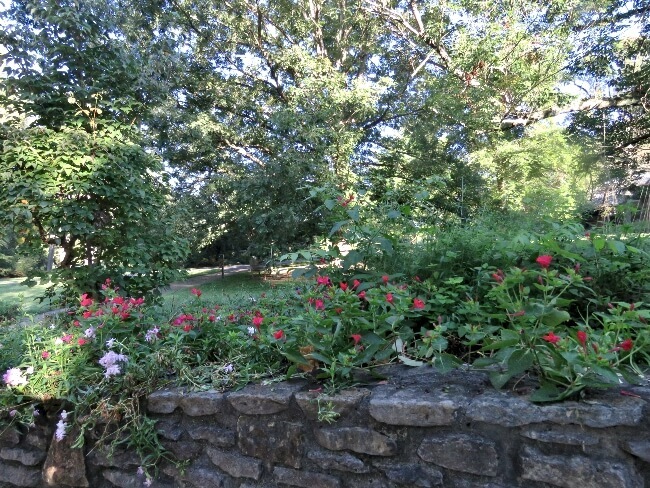 Bernheim Forest took me on trip to the past. Native birds flit all around. 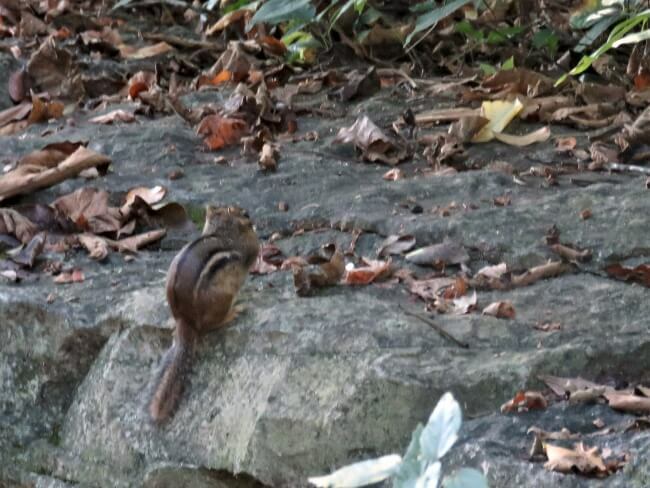 Chipmunks scamper about. Rabbits leisurely nibble blades of grass. Squirrels frenetically race up trees. 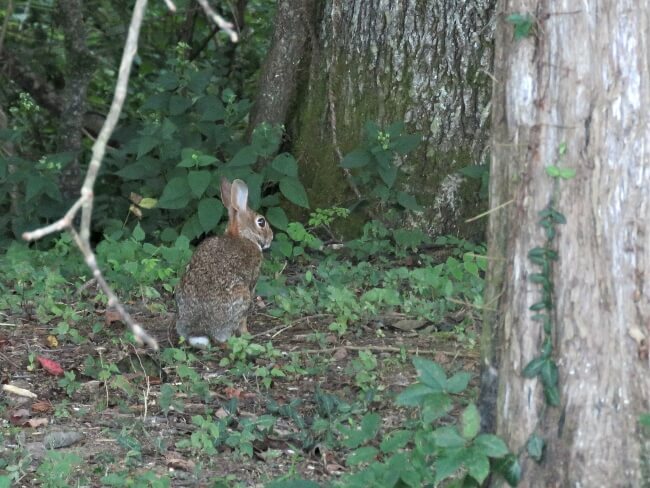 You might encounter deer, raccoons, a ground hog, or possum. A lonely male black bear lives here part of the year. He is shy and is rarely seen. 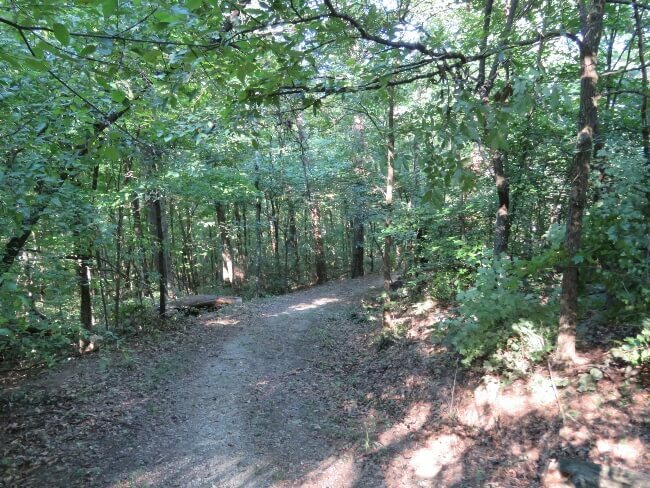 If you are the first person of the day on the dirt trails through the forest, then you will feel like the Hobbit, Bilbo Baggins in Mirkwood Forest. Spiders are everywhere! They do not bother me much, but I literally broke through dozens of webs. Snakes live mostly around water. The only poisonous snake in the area is the copperhead. They stay well hidden, though. You are more likely to see garter snakes. 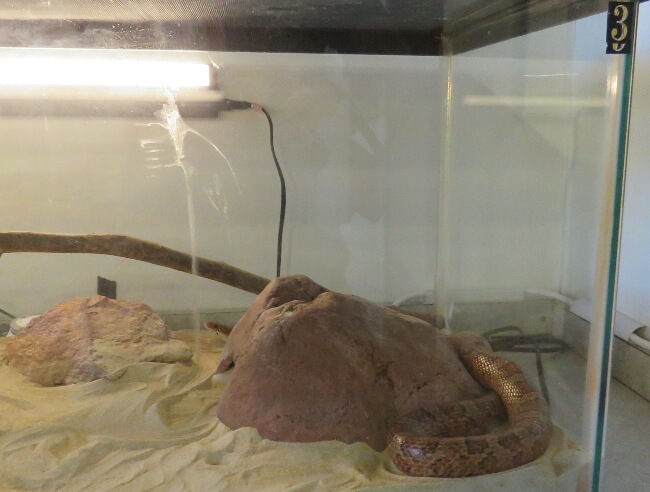 The only snake that I encountered was the one in the Education Center. 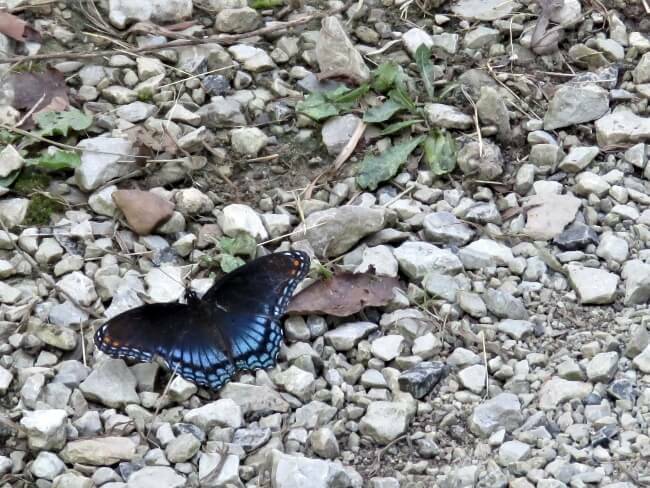 For those with little time or limited mobility, many of the sites in Bernheim Forest can be reached by car. 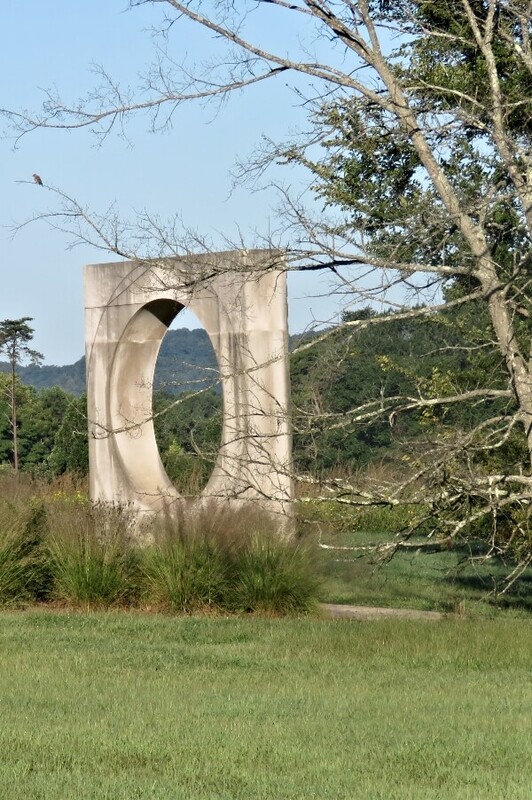 Frequent pull off areas in the arboretum section allow easy access to the Visitor’s Center, Educational Center, vistas, and sculptures. Many people bring their bikes to ride through the forest. A large portion of the paved roads have bike lanes. If you do not like to bike hills, then this might not be the best idea, especially in the forest section! Many of trails are fit for almost anyone. On several, you only walk a 1/4 mile or so. Others stretch for 1-2 miles, but are flat and easy. 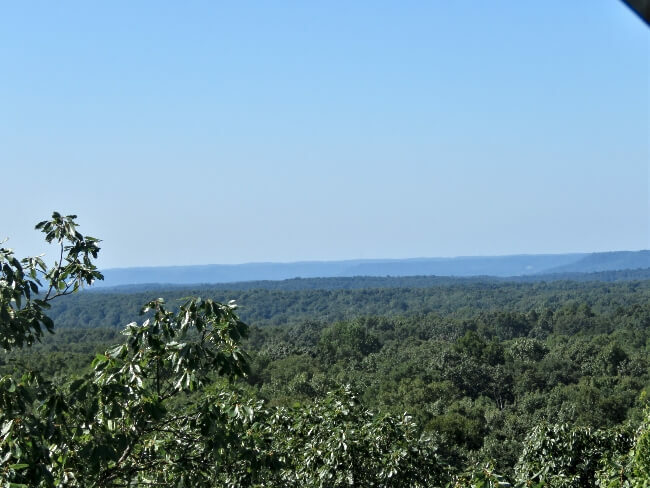 Hiking through the hills and hollers and to the top of the knobs of Bernheim Forest takes much more effort! Isaac Bernheim immigrated to the United States from Germany shortly after the Civil War. Moving to Kentucky, he earned his fortune distilling I.W. Harper bourbon. 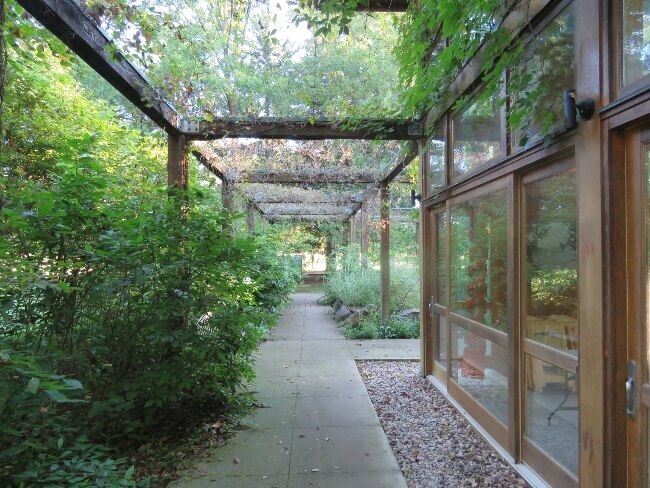 He and his wife had always wanted to have an arboretum and garden. In 1928, he purchased a large section of land that had been strip mined. 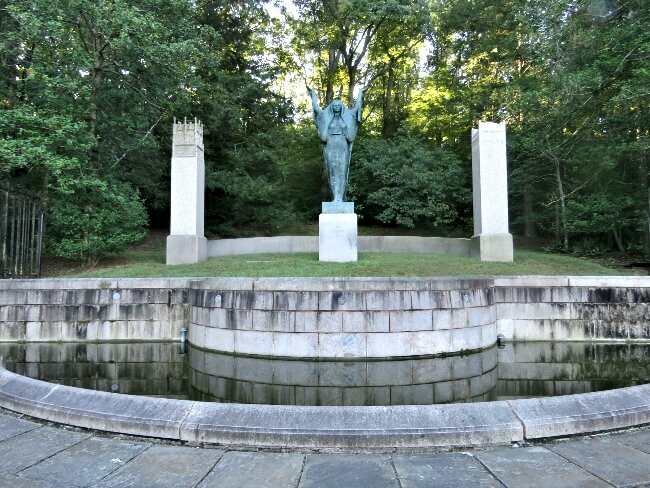 He hired the Frederick Law Olmstead landscape architecture company. Frederick Olmstead designed the Louisville park system and Central Park in New York City. “Let There Be Light,” the burial place for Mr. and Mrs Bernheim and their daughter. 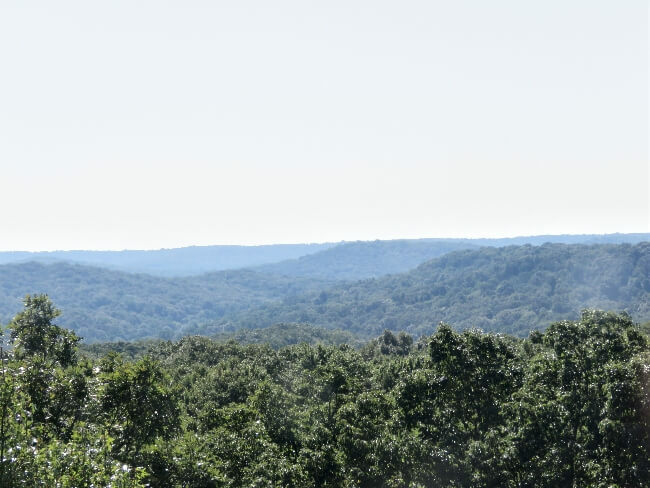 Even on weekends and holidays, Bernheim Forest is rarely crowded. Occasionally, special events or groups of school children can make certain areas crowded, but the park is huge. You can get away. Weather is the most important factor. Any time is good, but here are my preferences. Autumn in Kentucky is usually warm and dry. The oaks, maples, redbuds, dogwoods dramatically color the hills. Spring rains keep Kentucky green and bright. Flowers and flowering trees spring to life all around. The rains also make dirt trails muddy, though. Summer is hot and humid! Shades of green upon green create a verdant mosaic, keeping it scenic. If heat bothers you, though, summer will be uncomfortable. I hate winter. Grey skies, cool temperatures, and frequent drizzle dominate winter in Kentucky. 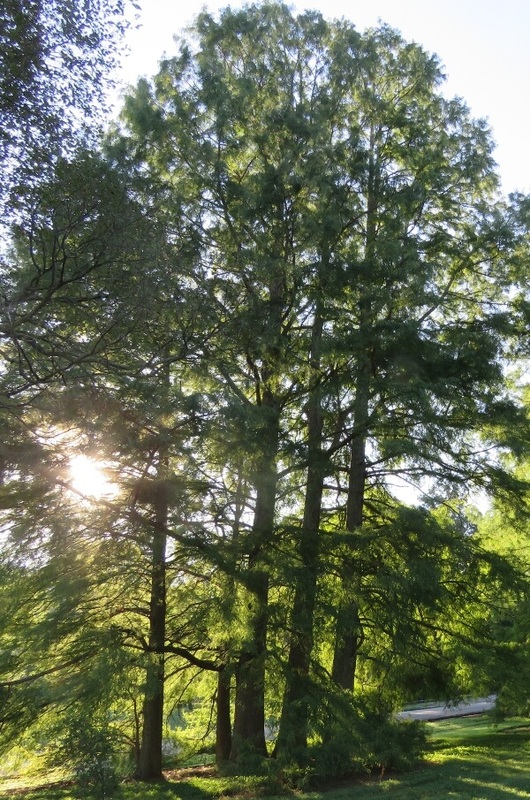 Green stands of pines and cedar keep some life visible. Mornings with fresh snow or a thick frost can be beautiful. More and more travelers are discovering Louisville, Kentucky: the Louisville Slugger Museum, Mohammad Ali Center, Churchill Downs and the Kentucky Derby, the Kentucky Bourbon Trail, and more. 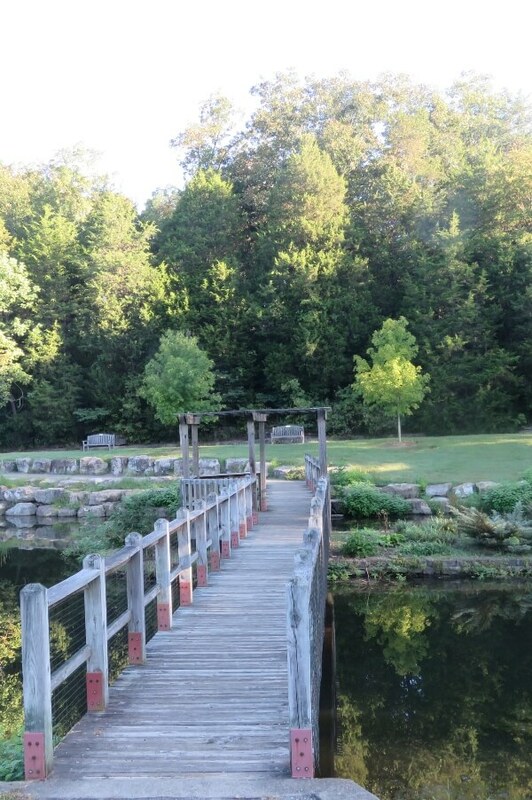 If you want to get out of the city and in touch with nature, then take an easy day trip to Bernheim Arboretum and Forest.